What do you do when you don’t have much time in the morning, are out of homemade muffins and waffles, the kids had yogurt, granola and fruit the day before and you want to make sure your family has a well-balanced and healthy breakfast?……..Enter…. 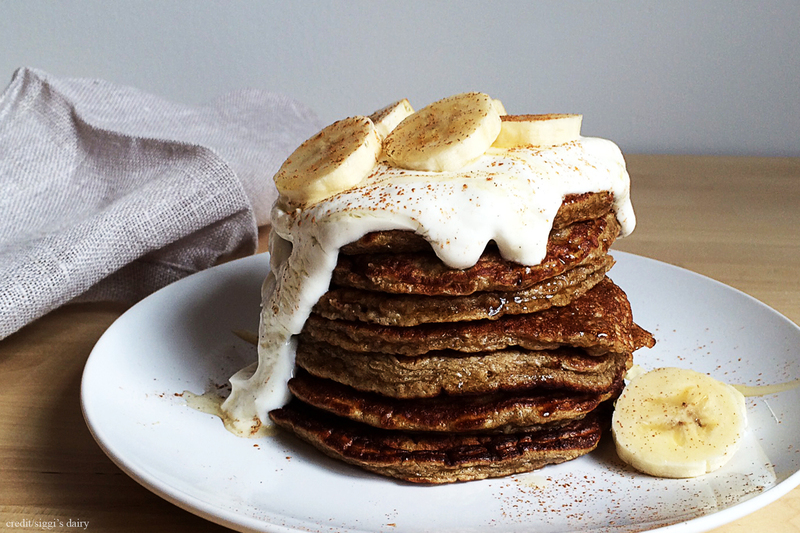 Banana Bread Protein Pancakes! I absolutely adore simplicity in the kitchen and I try to make sure that I am not a slave to food prep while continuing to feed my family wholesome meals. Below is a simple morning pancake recipe that takes just a few minutes longer than it would for you to make pancakes using a store-bought box of highly processed pancake mix. My kids love these, I enjoy them and they make wonderful leftovers. The bonus is the added protein from the siggi’s skyr, which I find helps to keep my kids a little more satisfied and satiated and helps to keep me out of a morning carbohydrate fog. If we have leftovers (as I usually make multiple batches at one time….they freeze well too) I sometimes pack the kids pancake sandwiches for lunch filled with cream cheese and berries or peanut butter and bananas. These pancakes are so simple and delicious and can easily be made gluten free!